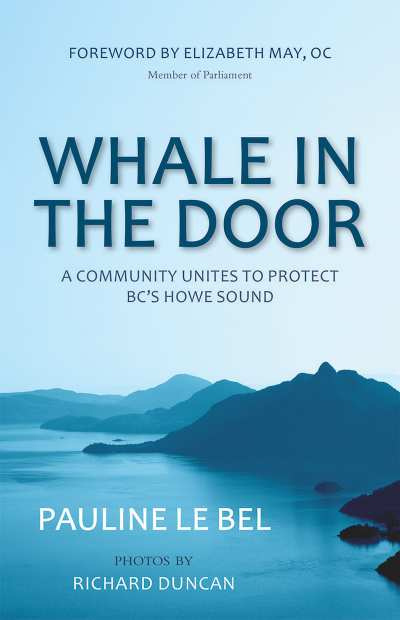 Pauline Le Bel’s most recent book of literary non-fiction is ‘Whale in the Door: A Community Unites to Protect BC’s Howe Sound’. This wonderful beautifully written book has received great reviews. Salt Spring Island Library at 7 pm. Galiano Island Library from 3 to 4.30pm. As part of the ‘Our Fragile Planet Series’ 7 pm. Whistler Public Library starting at 7pm..
Foreword by Elizabeth May and photos by Rich Duncan, it is a book that has helped me fall in love with Atl’Kitsem / Howe Sound, a spectacular fjord in Vancouver’s backyard.